All images on this page © the author. Camera used: Minolta SRT-101. Barn from Hambrook, Sussex (Centre) with Toll Cottage from Beeding, Sussex (Left) and Mediedal House from North Cray, Kent (Right)This is a view looking just East of South towards Hambrook Barn in the centre background. Hambrook Barn houses (1989) the museums introductory exhibition comprising displays on bricklaying, tiling, thatching, glass work, lead and iron work. Barn from Hambrook, SussexHambrook Barn is a typical, for the area, three bay barn but with a characteristic aisle which runs around all four sides broken only by the high doors at the front. 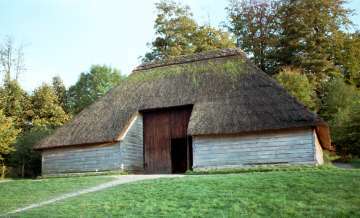 The barn's frame is of oak with elm boarding and reed thatch and is a very good example of typical building practices of the place and period. The barn originates from 1771 and Priors Leaze Farm, Hambrook. This way to the Museum Introductory Exhibition as it was in 1989. The pictures on this second page may be of interest to those wishing to see internal details of the barn's construction. Feel free to e-mail me with any comments and feedback.